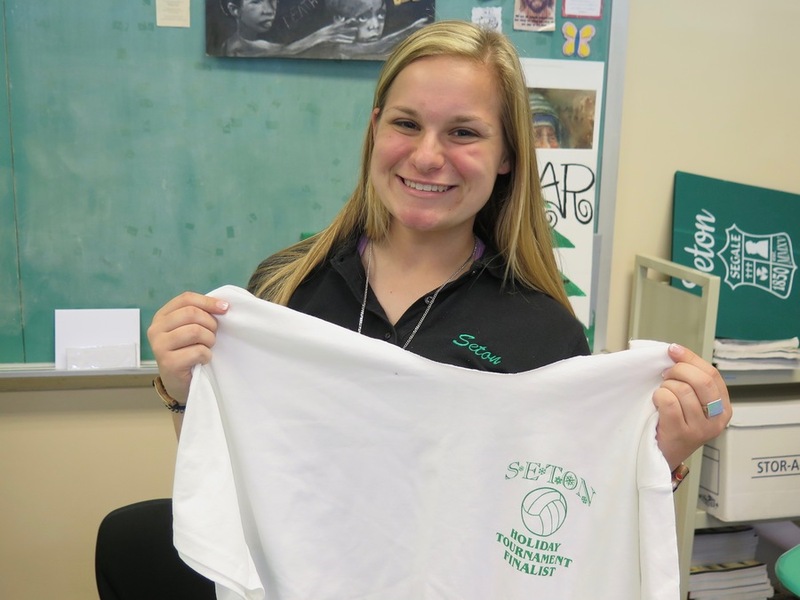 CINCINNATI -- This is a story about how a bunch of Seton High School students turned hundreds of unwanted T-shirts into blessings for a St. Vincent de Paul food pantry. It all started when Al Kovacic, Seton’s community service coordinator, took several students to the National Catholic Youth Conference in Indianapolis last November. Junior Caroline Klug was among the girls who went. The bags are surprisingly simple to make. There is no sewing involved -- just cutting and tying strips of fabric together. Making the bags is so easy that Kovacic, Caroline and the other students who went to the conference thought they could be a perfect project for the school’s Lenten Challenge. More than 300 Seton students participated, and the school ended up making about 350 bags that Kovacic and his students have donated to St. Vincent de Paul for use at its West End food pantry. The t-shirt bags, on the other hand, can hold a lot more food and are much sturdier than plastic. They also have large enough holes that people can carry them on their shoulders instead of stacking plastic bags on their forearms. 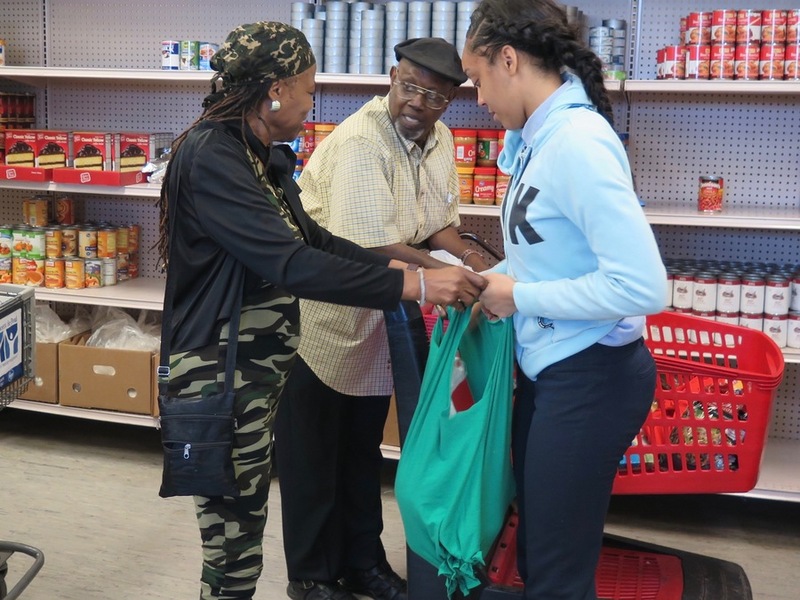 Winetta Booker, left, and her husband, James, center, with a helper from St. Vincent de Paul as they shop in the food pantry. And all of that is a big help, especially for people who walk or ride the bus to take their food home from the food pantry. St. Vincent de Paul began handing out two of the reusable T-shirt bags to each person shopping at the food pantry after Seton delivered them, and the bags were a hit right away, Cusick said. 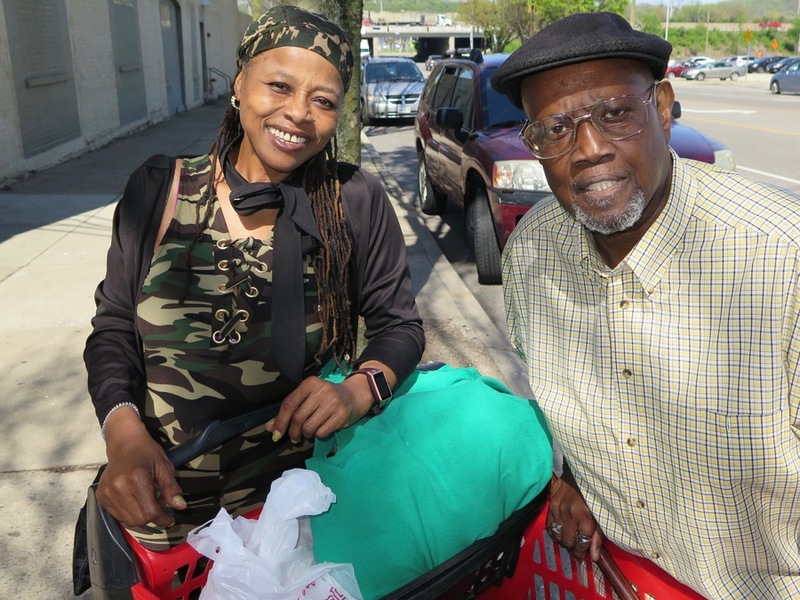 Winetta Booker got a couple earlier this month when she and her husband, James, visited the food pantry. Booker said she liked how colorful the bags are and how the handles make them easy to grab. “They’re going to be helpful, and I will be using them,” she said. Winetta Booker, left, and her husband, James Booker. 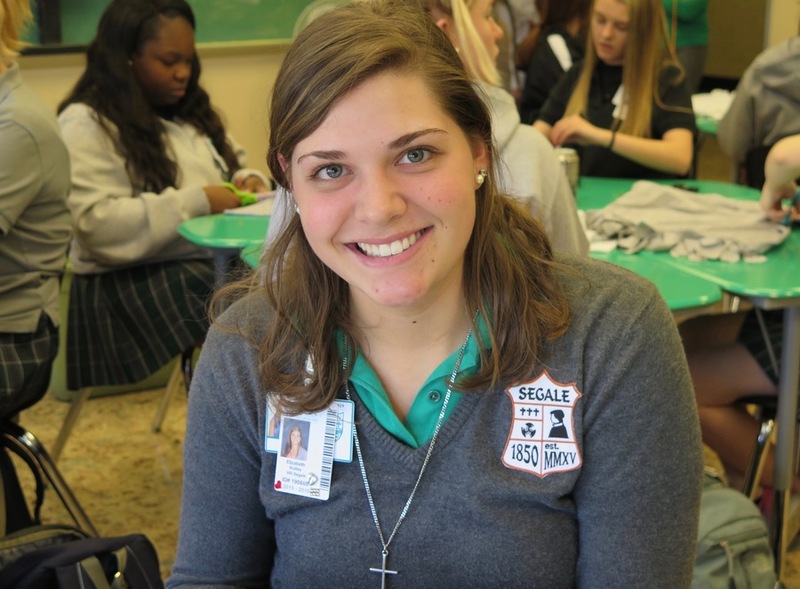 Back at Seton, students have been making as many bags as they can in classes or groups. Junior Liz Rolfes didn’t go to Indianapolis last year. But she thought the bags were “really cool” and liked the idea of making them as part of the school’s Lenten Challenge. 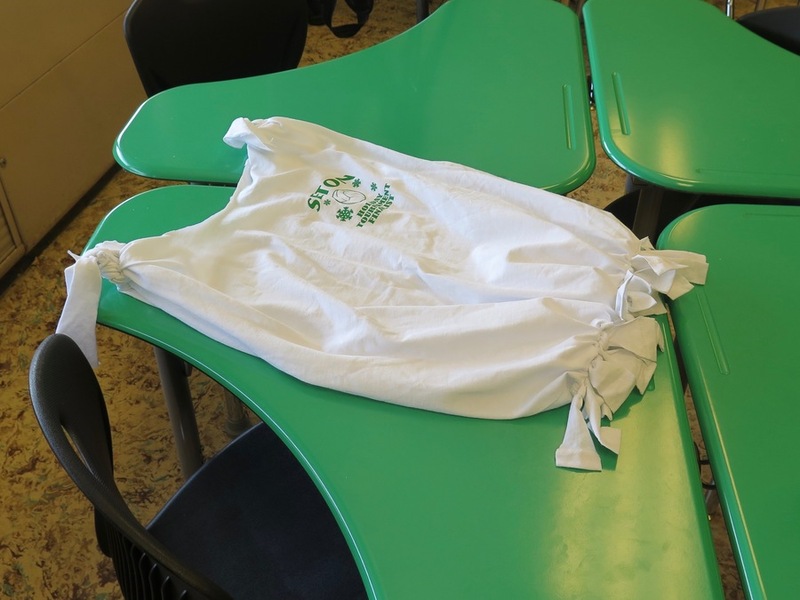 Both Liz and Caroline said they were surprised that the small act of turning old T-shirts into reusable bags had made such an impact on St. Vincent de Paul and the people that received the bags at the food pantry. “It’s great to know that we can make that big of a difference in such a small amount of time,” Caroline said. That’s an important part of the lesson, too, Kovacic said. The Seton students learned more about what it’s like to need to get groceries from a food pantry and how difficult it can be to get that food back home on the bus or on foot. In that way, learning to make the bags taught the Seton students a lot more than a simple craft project, he said. Cusick said other volunteer groups who have seen the T-shirt bags have offered to make more for St. Vincent de Paul. The food pantry, she said, will take as many as it can get.